The buddy update is out, and people have already been playing around with it. Specifically, the Silph Road. The Reddit community claims to have found a neat little Easter egg that goes alone with the new update. And, as with earlier easter eggs, it’s all related to the show. It’s all centered Ash’s favorite companion, Pikachu. If you choose Pikachu as your buddy, he will be shown next to you on your trainer details screen. 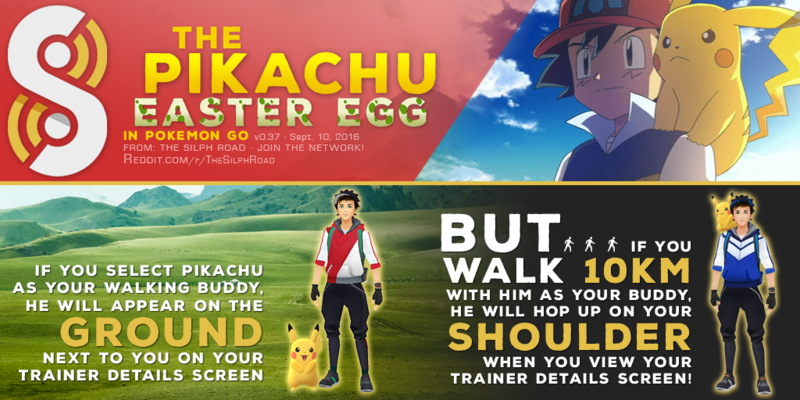 However, after traveling 10 km with your Pikabuddy, he’ll be shown riding on your shoulder in the details screen. I’m not surprised that Niantic would add another callback to the show that started it all. And I won’t be surprised when they keep the Easter eggs coming.